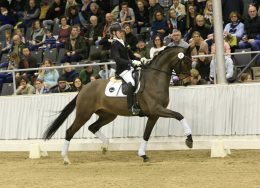 The first horse presented in the inaugural Hanoverian auction of 2019 claimed the highest price when the typey bay Der Keiler went under the hammer for €88,000. Bred and exhibited by distillery owner Carl Graf von Hardenburg, he was sold to a top Belgian dressage trainer who has been a regular Verden customer for 25 years. Second in the price stakes was a brilliantly moving dressage talent, Fürst Benno (Fürst Belissario x Worldly), bred by Klaus Kropp, who will make his new home in Spain following a telephone bid of €75,000. Of the horses sold, 34 achieved prices of €15,000+, which auction manager Jörg-Wilhelm Wegener pronounced as 'solid'.